No matter what crabs you have on hand, use this guide to get them ready to eat. Crabs kept on ice or in the fridge will be lethargic, but even they should respond to being picked up or moved around with a bit of leg movement. If you're choosing crabs from a tank or cooler, look for feisty specimens. You'll want to cook the crabs before you clean them. Boiling is more common, but steaming crabs emerge from the pot less water-logged and more filled with their own crabby juices. To Boil: Bring a large pot of water to a boil. Add enough salt so it tastes as salty as the ocean. Add any spices or herbs you like (Old Bay has plenty of adherents, for example, and it's easy to make a homemade version, too). Add the crabs and simmer until they are cooked through, 10 to 15 minutes depending on the size of the crabs. To Steam: Bring about an inch of salted water to boil in the bottom of a large pot. Set a steamer basket in the pot and the crabs in the basket or, if you have a lot of crabs, simply pile them in. Cover the pot and steam until the crabs are cooked through, 10 minutes for small blue crabs and 15 for larger Dungeness and up to 20 minutes for even bigger crabs. Remove the crabs from the pot and let sit until cool enough to handle. You can rinse them quickly under cold water to move things along. Other people wear latex gloves to protect themselves from the heat of the shells. After you've pulled off the apron, you will see a small hole between the body and the top shell, or carapace, at the back of the crab. Hold the body with one hand and pull off the top shell by grabbing the shell where that small hole is. The liquid that will come out is called "crab butter" (it's the fat from the back of the crab) and many people save it for use in soups or even as a dipping sauce for the crab itself. If you want to reserve the crab butter, make sure to hold the crab upside-down and pull the body up and out of the top shell so the shell collects the liquid. Most people discard the carapace, but some people like to clean the shell is use it to serve crab salad. Once the top shell is gone, you'll see the crab's insides. Along the top are two rows of opaque, feathery gills. These are not tasty. Simply pull them all off and discard them. The mandibles, at the front of the crab, need to be removed - simply snap the two pointy things to break them away from the crab and discard them. The remaining parts of the crab (besides the shell) that you don't want to eat are the guts. In the world of cleaning animals, crab guts are pretty innocuous. Simply rinse them out under cool running water. You now have a fully cleaned crab. After you've done one or two, they go pretty quickly. 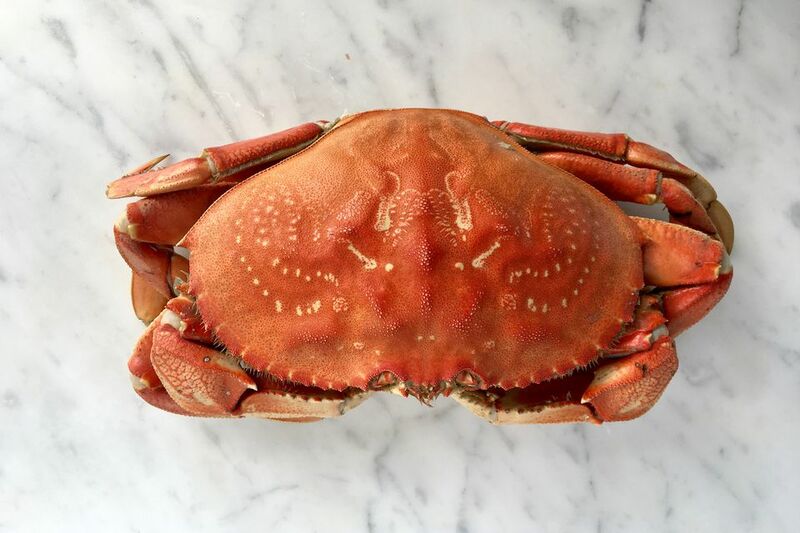 A cleaned crab is ready to serve if you're having people pick crab meat themselves (you can offer guests homemade aioli, alongside the crab butter, for dipping), or ready to pick if you are going to use the crab meat in another dish like crab cakes or gumbo. Smaller cleaned crabs can be served whole, but you'll want to break up larger crabs for people to work from or if you're going to pick the crab meat before serving. Most crabs can broken in half or into quarters by hand. Use a large knife to cut apart bigger or tougher crabs.